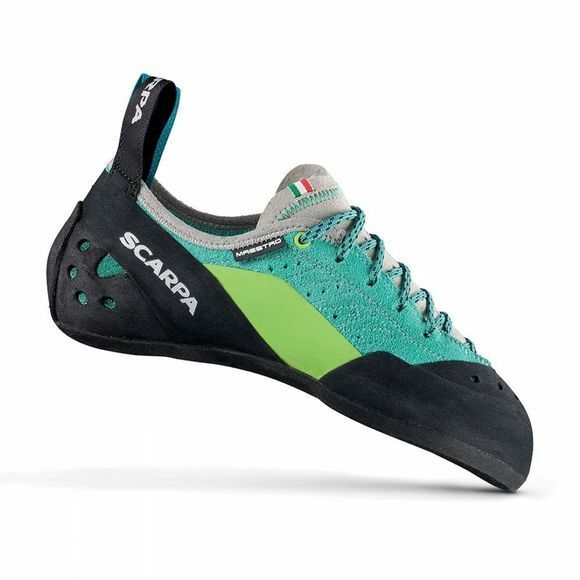 A revolutionary shoe for women that offers stability for standing on small edges and yet has enough flex for smearing. The secret that lies within this shoe is its refined layers of technology. Starting with an intricately-stitched 3 panel Eco Leather upper with air holes for long term wear and comfort. A full-length Janus 1.1mm plastic insert and IPC-Tension active randing system gives integral support to the foot while under pressure on small holds and maintains flex for smearing while Combination lace system spreads pressure evenly across the forefoot. Built on a master-crafted FY last, the Maestro WMN has a straight and slightly downturned shape with a medium-to-low angled toe box that allows the Maestro to be fitted with a semi knuckled-up or flatter toe position depending on what you're after. All this sits on a 4mm Vibram XS Edge full length sole combined with 2mm XS Grip 2 heel underlay.